No Code? Apply to Join! 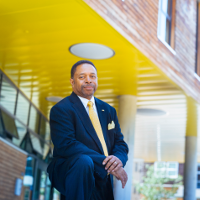 LeNorman Strong is currently serving as the Associate Vice Chancellor of Student Affairs for Residential Student Services. Prior to assuming this role, Strong served for ten years as Assistant Vice President for Student and Academic Services at Cornell University in Ithaca, NY. Prior to that he held a similar role at The George Washington University in Washington, DC where he also served on the faculty of the Graduate School of Education and Human Development (adjunct). Strong holds a Master's degree in Education and Human Development from The George Washington University, a Bachelor's degree in Business Administration from the University of Texas at Arlington; and is presently a candidate for a Doctorate of Education in Higher Education Administration from The George Washington University. In addition, he holds a Certificate in College Business Administration from the National Association of College and University Officers/University of Kentucky. GET STARTED WITH SCLA TODAY!